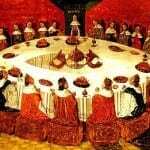 If Arthur is on the upswing, how about his fellow Knight of the Round Table? 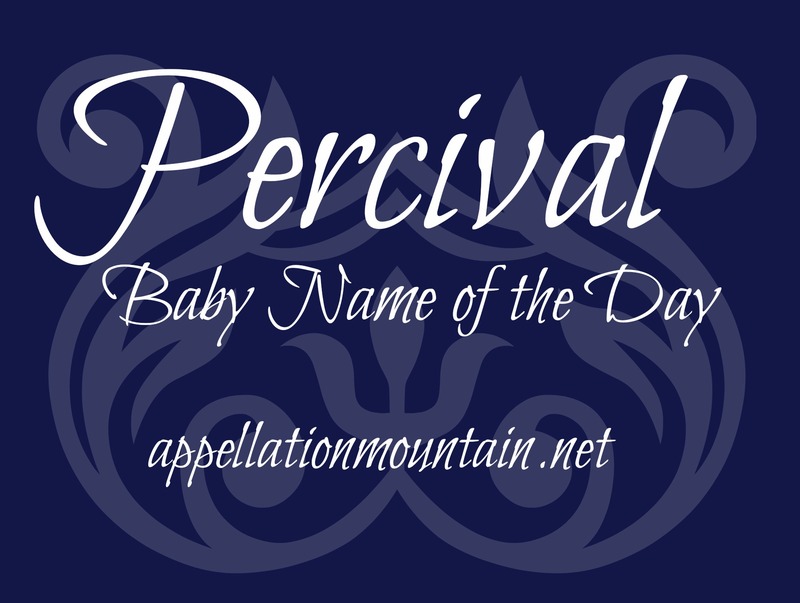 Thanks to Bertram Bergamot for suggesting Percival as our Baby Name of the Day. In 2013, eight boys were named Percival. That’s pretty much the norm. Back in the 1920s, there was one year when more than two dozen Percivals arrived – but that’s not exactly a trend. 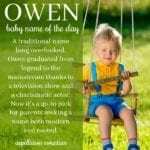 Still, this name has history aplenty, and many names that claim similar roots have become quite popular. Besides Arthur, there’s also Morgan and Gavin. 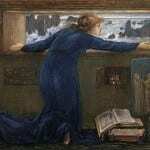 Even Guinevere has been more frequently used. The story begins in the 1100s, with Chrétien de Troyes. de Troyes penned an entire poem about the knight: Perceval, le Conte du Graal. The author claimed to be working from an earlier source, and it is possible he took the hero’s name from the Welsh Peredur. There’s more than one Peredur in earlier works, including Geoffrey of Monmouth’s not-exactly-historical Historia Regum Britanniae. Percival’s big claim to fame is that he sought the Grail, though the story has changed considerably over the centuries. In most tellings, he’s raised in the forest, kept sheltered by his mother, but always knowing his destiny is to become a knight. He’s usually of noble birth, though in the BBC’s Merlin, Percival is a commoner of uncommon abilities. Sometimes he’s a sidekick to Sir Galahad, son of Lancelot. In some tellings, he dies after finding the Grail. 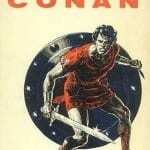 In others, he marries Blanchefleur and their son Lohengrin goes on to have adventures of his own. Richard Wagner’s opera Parsifal was first performed in 1882. Wagner based his telling on a thirteenth century poem by Wolfram von Eschenbach. In von Eschenbach’s poem, Percival became Parsival. Wagner’s Parsifal came from a folk etymology, connecting Parsifal to the Arabic phrase fal parsi – pure fool. Robin Williams played a homeless man seeking the Holy Grail in 1991’s big screen reboot of the legend, The Fisher King. Williams’ character was called Parry – and earned him a Best Actor nomination at the Academy Awards. The BBC series Merlin gives Percival more humble beginnings, but he quickly becomes a hero. In Wilkie Collins’ The Woman in White, there’s a Percival – but he’s a bad egg. The Scarlet Pimpernel was an English aristocrat who secretly rescued nobles from the guillotine during the worst of the French Revolution. His real name was Percival Blakeney, though he was usually called Percy. John C. McGinley’s character on Scrubs was named Percival Ulysses Cox, though he answered to Perry. In the later seasons of Little House on the Prairie, Nellie Oleson marries a man named Percival Dalton. Albus Dumbeldore’s father wore this name, and it was a middle for Albus. There were a few other uses in the Harry Potter series. Though one oft-cited Percival is not a member of the club. Percy Weasley is just plain Percy. Speaking of Percy, it works well as a nickname, but actually derives from Perci, a place name in Normandy, and later a surname that became a given name – think Percy Bysshe Shelley. Likewise, Perry is a possible nickname, but actually comes from the given name Harry, via the Welsh ap Harry – son of Harry. Altogether, Percival is an obscure rarity that would take a certain amount of style to wear well – but could, in our age of Sebastian and Jeremiah, wear well. What do you think of Percival? Is this name wearable today? Percy is on the upswing in Britain, Percival makes a great alternative. Reminds me of Percy Harvin (football player)… though I believe Percival is his middle name, not first. Love the nickname “Percy” for it! Very wearable. Percival is a great name, and while I don’t think I would use it myself, I would love to meet a Percival. How can you go wrong with a name that has so much history and the nicknames Perry, Percy, and Val? So excited to see this as the name of the day! Percival was our absolute top contender for a possible future boy (we already have a Theodore “Theo”) but we have cooled towards it a little….We’re afraid it may be too rare. I also wish there were more nickname possibilities. It’s definitely an undiscovered gem though!